How bad smoking is for our health. Almost everyone knows that smoking causes cancer, emphysema, and heart disease that it can shorten your life by 10 years or more and that the habit can cost a smoker thousands of dollars a year. 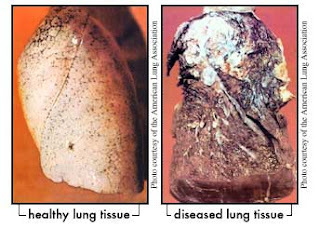 Smoking is a hard habit to break because tobacco contains nicotine which is highly addictive. Like heroin or other addictive drugs, the body and mind quickly become so used to the nicotine in cigarettes that a person needs to have it just to feel normal. There are no physical reasons to start smoking. The body doesn't need tobacco the way it needs food, water, sleep, and exercise. The body is smart. First-time smokers often feel pain or burning in the throat and lungs, and some people feel sick or even throw up the first few times they try tobacco. Over the long term smoking leads people to develop health problems like heart disease, stroke, emphysema and many types of cancer including lung, throat, stomach, and bladder cancer. 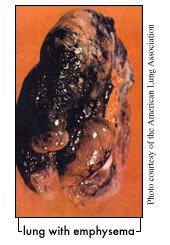 Each time a smoker lights up, that single cigarette takes about 5 to 20 minutes off the person's life. Smoking can also cause fertility problems and can impact sexual health in both men and women.